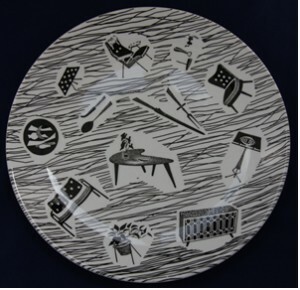 A newly married couple setting up home in the 1950s or early 1960s might have chosen the cheap, but contemporary, Homemaker range of ceramics for their dinner or tea service. Homemaker combined an award-winning modern shape, Metro, by Tom Arnold, with a pattern by Enid Seeney showing contemporary furniture and household items against a background of black lines. Enid Seeney designed the pattern in 1956 for new shapes designed by Tom Arnold. She called the new design 'Furniture'. However, executives thought it might be too radical for public tastes and public reaction at an exhibition in Blackpool was disappointing. 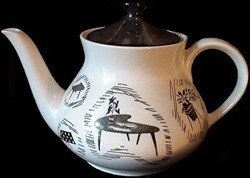 However, Seeney still believed in the design and her team produced a prototype coffee set. Homemaker came to the attention of Woolworth's only by chance. A buyer visiting Ridgway (yes it is spelt like that, not Ridgeway) in May 1957 saw a prototype coffee set made up by Seeney. He thought it would sell and immediately placed a large order for it. 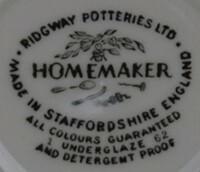 Homemaker was mass produced ceramics. It would have been impossible for a design sold by Woolworth's to be hand painted. Ridgway used a new printing process, the Murray-Curvex litho process. The pattern was applied in reverse to the bottom of a gelatine pad (or 'bomb'). The wet paint was then transferred to the piece in a way that would allow it to mould to the shape. This process made all-over patterns such as Homemaker possible. Tom Arnold designed the shape onto which the Homemaker pattern was applied. It was known as 'Metro'. Metro along with the 'Conference' pattern by another designer, Pat Albeck, won the coveted Council of Industrial Design, Design of the Year Award in 1957. 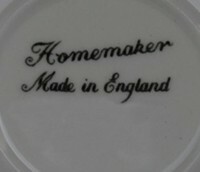 Homemaker was later produced on different shape, Cadenza. Homemaker brought good quality design to a mass market. The pattern itself displayed some of the most exclusive designs of furniture from the early 1950s including a chair by Robin Day, a sideboard similar to a Gordon Russell design and a two seater-sofa by Swedish designer, Count Sigvard Bernadotte. These designs would have been far too expensive for people who bought Homemaker. At the time, Homemaker would have been a far from subtle contemporary statement. The Woolworth's buyer was spot on. It was just the thing that would appeal to a young working class couple wanting a contemporary look to their home. Today Homemaker is loved by anyone into modern design from the 1950s and 1960s. Homemaker was produced on two shapes. The original Metro, designed by Tom Arnold from 1957 and Cadenza (see teapot in picture above, right) designed by Margaret Simpson from 1966. The Cadenza shape can be seen in a different style of teapot, coffee pot and milk jug and also in a different style tureen (vegetable dish). 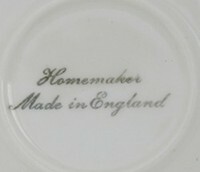 There were five different styles of backstamp used on Homemaker. The first three (above) were used on early pieces up to around 1962. The first one is probably the oldest, from 1957. 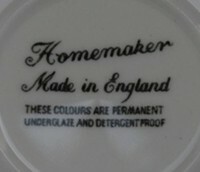 The text "THESE COLOURS ARE PERMANENT UNDERGLAZE AND DETERGENT PROOF" was probably added later. The fourth back stamp was used from 1962 onwards. You can see a date on the fourth photograph above, it is on the second line from bottom on the right hand side, '62'. I have seen 62, 63, 64, 65, 66, 67, 68 and 70. There is also another number on the left hand side, a '1' shown here. It represents the first or second half of the year. You will see either '1' or '2'. This style of backstamp was also used without the date information. The fifth style of backstamp (not illustrated) was the similar to the fourth (fourth photograph above), but larger with HOMEMAKER printed in a larger font. Homemaker was also produced with no backstamp. What is on the Homemaker pattern? Values of the rarer pieces are quite high. You will need £100 for a coffee pot in perfect condition. However, the plates and teacups are still reasonably priced. This guide is from the latest sold prices on eBay. Coffee and tea pots are also quite rare, as is the Homemaker tray. You will get the best price and the widest choice. You will, however, need to be aware of your facts to successfully buy on eBay. you can buy pieces in their eBay store. For more details on the Homemaker range see our guide to the Homemaker range. In compiling this guide I found Homemaker: A 1950s Design Classic by Simon Moss extremely useful. If you want to be a serious collector of Homemaker, I strongly suggest you buy a copy. The second revised edition contains some interesting extra information about rare pieces. It will also help you make informed buying decisions on eBay and not be caught out by the hype. I also found Ceramics of the '50s and '60s: A Collector's Guide (Miller's Collecting Guides) to be useful. "Thanks you so much for the info. I have 2 different sized cups? Do they have the same value? "Why not eBay? A dealer will want to build in a profit for any price he/she offers you. Auctions have higher costs and are often on weekdays, so only dealers buy.